Any of the following symptoms may indicate a functional vision problem. Please read and check the symptoms that you are currently experiencing. This is a critical step in helping us understand the type and amount of functional vision problem that may exist. Do you (or your child if you are filling this out on their behalf) experience any of the following? 26. Experience difficulty tracking moving objects such as balls, etc. 28. Experience difficulty with eye-hand coordination sports such as baseball, etc. 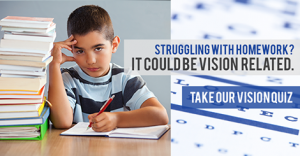 Learn about the Chromagen system for for Visual Reading Disorders associated with Dyslexia.